(Sp) Chameleon Blocks by Bonitronic are chargeable magnetic lighting shapes that change colors when touched. Encourage kids to create unique designs and patterns and to explore with colors while working on spatial reasoning and motor skills. Stick them to a fridge or play at a table. Chameleon Blocks can also be used as a night light. The Baby Newspaper by People Brain Builders makes a fun crinkly sound when crumbled up and then immediately returns to it’s original form without ever tearing. Playing with this Baby Newspaper teaches cause and effect, and promotes fine motor skills and coordination. 4 months and up. In this Farm House Shape Sorter by BigJigs, children sort and match by animal instead of shape. This works on more precise visual discrimination, teaches animal names, and encourages problem-solving. 12 months and up. Suction Kupz by Fat Brain Toys are a fun open-ended toy that will entertain and keep babies, toddlers, and even preschoolers busy. Bend, stack, and attach them to any flat surface. Suction Kupz make a great travel toy and can be useful at restaurants. Playing with Suction Kupz also promote creativity, motor skills, and sustained attention. 12 months and up. This flexible Wooden Puppy Acrobat by Cubika comes with parts that are attached with elastic bands that can be bent, pulled, and twisted. Puppy Acrobat makes a great fidget toy, works on fine motor skills, and promotes independent play and exploration. 18 months and up. Snap & Design Monster Trucks by LakeShore Learning include 3 oversize truck bodies and accessories to design your own monster trucks. When finished designing push back the trucks to watch them drive! This toy encourages sustained attention, decision making, fine motor skills, coordination, and imaginative play. Ages 3-8. This simple craft kit by Toyish includes everything kids need to create their very own Ballerina toy while practicing coloring, engineering, and using their imaginations. This is a great confidence building activity for ages 3-8. Katamino Family is a 2 player game that kids as young as 3 years old can play. Be the first player to fill in all of the pieces shown on your card to win the round. This game comes with instructions for multiple game variations that will challenge spatial reasoning, problem-solving, and concentration. Cat-Tastrophe is a fun fine motor game that teaches about balance, encourages problem-solving, and promotes concentration. The goal of the game is to poke out the “leaves” to help the cat down from the tree without letting him fall. Ages 5 and up. Offbits by Fat Brain Toys comes with a variety of unique building parts for kids to create their own robots and characters. Offbits promotes creativity, motor skills, problem-solving, decision-making, and sustained attention. Ages 6 and up. The Dot Creativity Kit Robot by Wonder Workshop teaches kids how to code as they program him to play Duck Duck Goose and Hot Potato. Dot includes accessories to decorate him with and is compatible with 3 free apps for more play ideas. Ages 6 and up. Erwin the Little Patient by Sigikid teaches kids as young as 3 about their bodies. Erwin comes with a booklet explaining the function of each organ in a clear and simple way, and the organs are color-coded for easy assembly. This is great toy for encouraging pretend play and building imagination. Ages 3 and up. Kanoodle Head to Head is a 2 player version of the original 1 player visual spatial puzzle game called Kanoodle. In this game players set up their game boards as shown on a chosen challenge card and then rush to fill in all the remaining pieces before their opponent. Kanoodle Head to Head promotes problem-solving, critical thinking, spatial reasoning, and a quick reaction time. Ages 7 and up. 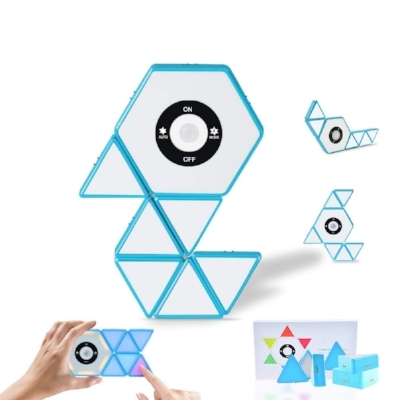 Distraction by Thinkfun is a fun concentration and memory card game for the whole family. Players take turns drawing number cards and remembering a growing sequence of digits. If you draw a distraction card you first have to answer a quirky question before reciting your number. If you repeat the sequence incorrectly you draw cards. Player who runs out of cards first wins the game. Ages 8 and up. 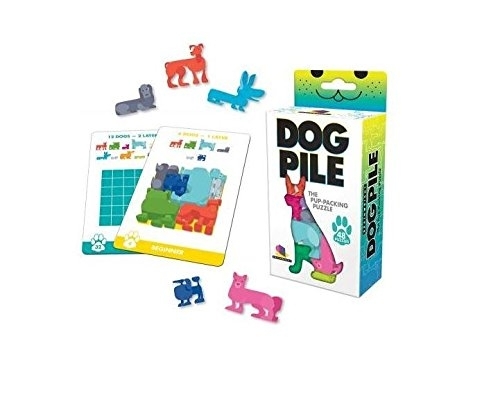 Dog Pile by Brainwright is a 1 player puzzle game that challenges visual perception and spatial skills. The goal is to arrange the dogs so that they all fit on the grid by following the challenge cards. Each challenge card has a different amount and size of dogs to play with. Ages 10 and up.